Do you have a Garfield fan in your house??!! Who doesn't love this fun, crazy cat, right? Well, then make sure to head to your local Ryan's, HomeTown or Old Country Buffet because starting May 1, 2015 and continuing through June 30, 2015, Thursday Family Nights will be welcoming America’s favorite fat cat, Garfield, to the dinner table. 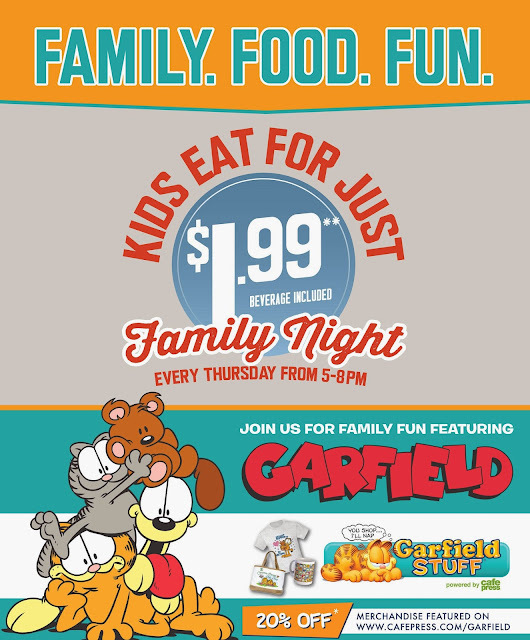 Kids dining at participating restaurants will receive one of three different Garfield & Friends Finger Puppet Perf & Play Activities for free when dining with their families any Thursday evening from 5 to 8 p.m. during the promotion period, while supplies last. The fun includes Garfield “Perf & Play” Finger Puppet Show Activities featuring mazes, games, and coloring fun. There will be three differently themed Garfield & Friends Finger Puppet Perf & Play Activities available throughout May and June – Make a Splash, Jammin Out, and Fiesta Fun. “We’re proud to have many repeat guests, which is why we wanted to offer a new, fun Garfield & Friends experience each time families return,” explains Crews. The Garfield play activities are free to all children. Within each Finger Puppet Perf & Play Activity, families will also find a 20% off Coupon Code that can be used toward the purchase of Garfield & Friends t-shirts, mugs, and other merchandise at the Café Press Garfield Store. Some exclusions may apply. Also on Thursday nights, kids 11 years and younger may eat for just $1.99. The buffet restaurants serve up a variety of home-style meals made fresh for you. For more information about the Garfield & Friends Finger Puppet Perf & Play Activities, visit www.Ryans.com, www.HomeTownBuffet.com, or www.OldCountryBuffet.com. Find your local Ryan's, HomeTown or Old Country Buffet here. (2) buffet meal passes and a Garfield DVD to a lucky winner!